It has been a long time since I have written a scientific post but I was intrigued by a discussion we were having the other day about the Deuterium to Hydrogen ratio (D/H) in exoplanet atmospheres and it got me thinking about Venus and its escaping atmosphere and how little attention is paid to its significance in the exoplanet community. Let me expand on my train of thought by first explaining what the D/H ratio is and why we care. Deuterium (D) is an isotope of Hydrogen (H) defined by the addition of 1 neutron to Hydrogen's original 1 proton + 1 electron configuration. Deuterium acts in the same way that Hydrogen does but is more massive or heavier than its original counterpart. Additionally there is a second isotope of Hydrogen called Tritium, which has two additional neutrons in its nucleus. Deuterium can also form water molecules, called heavy water, because it has the same chemical properties of Hydrogen. There is in fact one deuterium atom for every 10,000 Hydrogen atoms, and as there are two isotopes of Hydrogen we can then assume that one in every 5,000 water molecules should have Deuterium in place of Hydrogen. Consider then that all Hydrogen (and its isotopes) that exist in the universe today were created at the very moment of the Big Bang, because while Hydrogen is turned into other elements through nuclear fusion in stars, no new hydrogen or deuterium has been created since the beginning of the universe. This can be seen all around us by the D/H ratio in the Earth, Moon, comets, and even the space between stars which all have very similar D/H ratios ~ 1/1000. But here is the puzzling thing, and this is where Venus comes in, Venus has a D/H ratio 100 times that found on the Earth. This is not to say that Venus has more Deuterium than the Earth but that it in fact has less Hydrogen. Which takes me onto the escaping atmosphere part. Hydrogen is about half as massive as a Deuterium atom and on average will therefor sit higher up in a planet's atmosphere. This makes the Hydrogen gas, higher up in the atmosphere, more prone to escape than gasses found lower down. But Hydrogen and Deuterium have a natural affinity to form water molecules and would not be prone to escape; and this is where Venus gets interesting. While Venus is about 95% the size of the Earth and 82% of its mass, with an iron-nickel core and a rocky crust, it is noting like our fair planet. Venus has a very thick atmosphere almost entirely comprised of Carbon Dioxide. Its cloud filled sky is a bath of sulphuric acid moving at speeds over 200 km/h. From a distance the Earth and Venus are remarkably similar, but as always it is the smallest of difference which produce the most potent affects. The small difference in their distance from the sun, the lack of a magnetic field or ozone layer, the tinniest decrease in mass between the two planets, acted as a catalyst for the dramatic differences we see today. The smaller mass would result in less radioactive heat sources inside the planet causing the formation of a hard solid crust with little to no tectonic activity after the heat of radioactive decay ran out. The increased temperature due to is closer proximity to our host star leaves more water in the atmosphere as vapor than is locked up in rocks and oceans causing further solidification and drying out of the surface. This evaporation of liquid water releases the Carbon Dioxide dissolved in its depths locking more heat in to the planets atmosphere via the greenhouse effect until no water can survive as liquid on the surface. 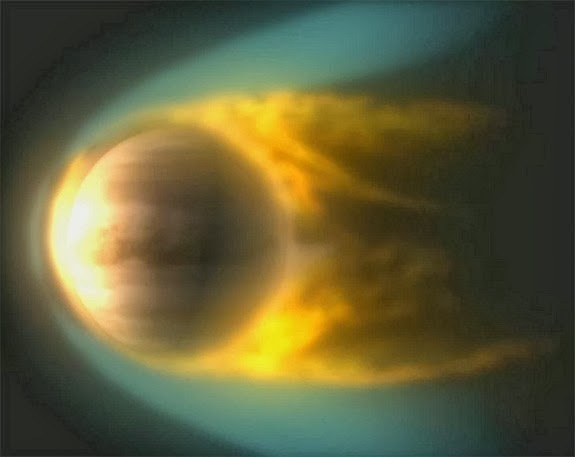 Venus' water was hot enough to remain a vapor in the upper atmosphere and without the protection of a magnetic field or ozone layer it was subject to harsh radiation from the Sun. Energetic Ultraviolet light bomb-barded the water molecules causing it to dissociate into Hydrogen and Oxygen, or 1/5000th of the time into Deuterium and Oxygen. These would then be prone to escape through further heating of the gas in the planets upper atmosphere. The thermal escape velocity of Venus' atmosphere is around 10.4 km/s, with Hydrogen's escape velocity at half that and Deuterium's around a third, it would not take much to cause either of them to escape. But again it is the small difference that make everything. Just 1.5 km/s difference in escape velocity means that Venus would loose 99.9% of its hydrogen atoms while only 90% of its Deuterium atoms escaped producing the abnormally high D/H ratio observed by the Pioneer spacecraft. So there really is a lesson to learn from the Earth and Venus, while from a distance they are unsuspecting twin rocky worlds in our inner solar system, they are vastly different worlds with many different intricate stories to tell. That and the smallest things can make the biggest difference. There were some great resources that I used for this article and they can be found in the links below so please have a browse.